Conflict is inherently messy, and today those analyzing conflicts are confronted with an incredible number of problems that resist resolution. Chaos, ambiguity, and contradiction are routine. The vast majority of today’s social conflicts can be characterized as “wicked problems,” meaning they are a combination of ill-defined questions and multiple possible responses. Simple answers are rarely sufficient to address the dynamics of modern struggle. 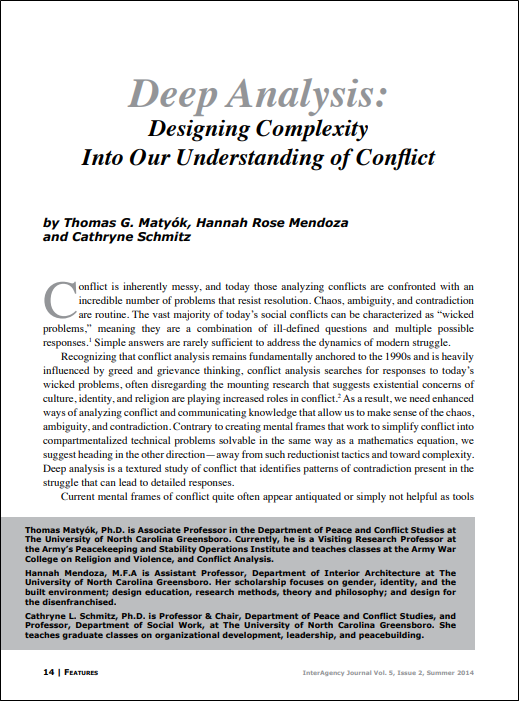 Recognizing that conflict analysis remains fundamentally anchored to the 1990s and is heavily influenced by greed and grievance thinking, conflict analysis searches for responses to today’s wicked problems, often disregarding the mounting research that suggests existential concerns of culture, identity, and religion are playing increased roles in conflict. As a result, we need enhanced ways of analyzing conflict and communicating knowledge that allow us to make sense of the chaos, ambiguity, and contradiction. Contrary to creating mental frames that work to simplify conflict into compartmentalized technical problems solvable in the same way as a mathematics equation, we suggest heading in the other direction—away from such reductionist tactics and toward complexity. 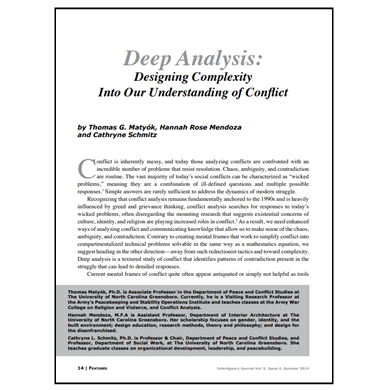 Deep analysis is a textured study of conflict that identifies patterns of contradiction present in the struggle that can lead to detailed responses. Thomas Matyók, Ph.D. is Associate Professor in the Department of Peace and Conflict Studies at The University of North Carolina Greensboro. 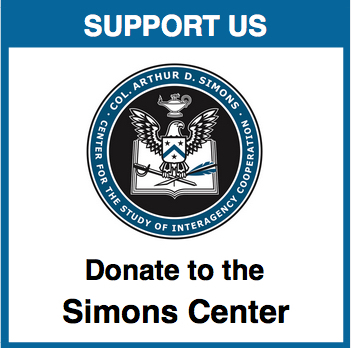 Currently, he is a Visiting Research Professor at the Army’s Peacekeeping and Stability Operations Institute and teaches classes at the Army War College on Religion and Violence, and Conflict Analysis. Hannah Mendoza, M.F.A is Assistant Professor, Department of Interior Architecture at The University of North Carolina Greensboro. Her scholarship focuses on gender, identity, and the built environment; design education, research methods, theory and philosophy; and design for the disenfranchised. Cathryne L. Schmitz, Ph.D. is Professor & Chair, Department of Peace and Conflict Studies, and Professor, Department of Social Work, at The University of North Carolina Greensboro. 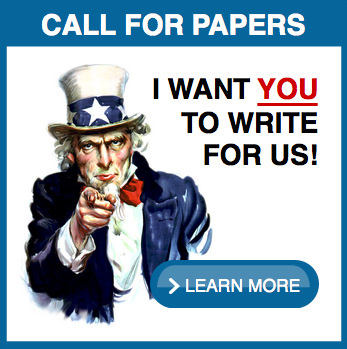 She teaches graduate classes on organizational development, leadership, and peacebuilding.